NHL News : Rumor: Dion Phaneuf's time in Los Angeles may be coming to a close. Rumor: Dion Phaneuf's time in Los Angeles may be coming to a close. Phaneuf's future up in the air. One of the most interesting develops of the week in the National Hockey League has gone largely uncovered due in part to the media's natural East Coast bias but also due to all the coverage surround the National Hockey League's trade deadline. In spite of the fact that many would consider veteran defenseman Dion Phaneuf to be on the down side of his career in the National Hockey League he remains one of the most recognizable names in the sport of hockey. Phaneuf has long since established himself as an every night guy in the National Hockey League and it is for that reason that many an eyebrow was raised earlier this week when Phaneuf was announced as a healthy scratch for the very first time in his career at the NHL level. The move was made by interim head coach Willie Desjardins and that had to make it an even more bitter pill for the experienced Phaneuf to swallow. According to a report from Curtis Zupke of the Los Angeles Times Phaneuf was bordering on defiance when the news was first announced and when you consider the man has played in over 1000 career NHL games you can easily see why he would bristle at being made a healthy scratch by an interim coach. Phaneuf has seemingly swallowed that bitter pill since then however and although his comments recently clearly showed he remains unhappy, he appears to have fallen in line behind his head coach. While everyone in Los Angeles may be saying the right things now not everyone is convinced that everything behind the scenes is as peachy as the Kings are making it out to be. The reality is that Phaneuf continues to eat up a large portion of their salary cap space and has produced very little this season while doing so. It's no surprise then that some see this as a split waiting to happen with Adam Gretz of NBC Sports stating that "it has become obvious based on his play, the new direction of the team, and Thursday’s decision that his future with the Kings should very much be up for discussion." 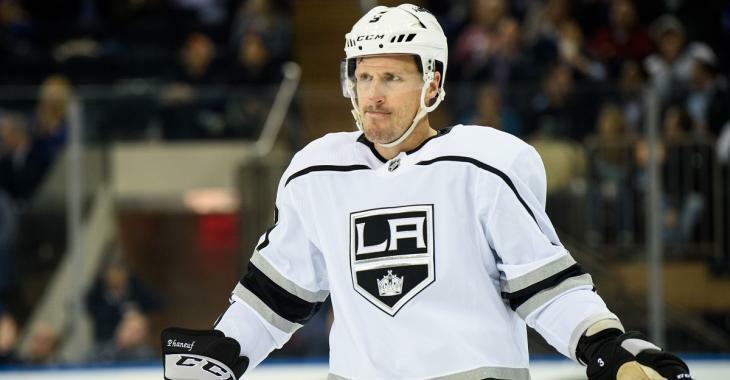 The Kings however will be hard pressed to find a place to move Phaneuf if they wish to do so, with his current contract it seems highly unlikely that anyone would be willing to take him in a straight up hockey trade. The Ottawa Senators currently are retaining a portion of Pahenuf's salary ($1.75 million) which means the Kings are only on the hook for $5.25 million of his contract. The Kings could in theory retain an additional $1.75 million but that would still leave the team acquiring Phaneuf on the hook for $3.5 million per season and given his play this year that may still be too much to ask of any other NHL organization. Alternatively the Kings could seek a buyout but that would leave them on the hook for $2.9 million next season, $5.4 million the following seasons and finally two seasons at $1.4 million. If the Kings exercise either of these options you have to imagine this becomes a low point in the career of Dion Phaneuf.